The Konica Minolta MagiColor 2430DL is a small-form, network-ready consumer laser printer capable of printing in both black and white and in color. Unlike other consumer or small workgroup Konica Minolta budget printers, it includes a number of features to better guarantee its future compatibility and usability. However, it does suffer from slow color print speeds and high maintenance and upgrade costs when compared to the cost of the unit itself. 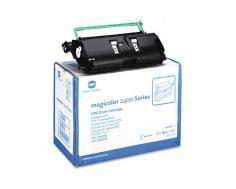 The MagiColor 2430DL measures 16.9" by 19.8" by 13.4" and weighs 39.7 lbs without toner cartridges or the drum unit installed. With consumables added, the printer weighs 44 lbs. At its small size, the printer will fit comfortably on a desk or table alongside other equipment seeing regular use. The printer is rated at up to 20 pages per minute in black and white and up to 5 pages per minute in color, about average for consumer laser printers released in the mid-2000s. It has a maximum paper input of 200 sheets and supports printing to standard paper sizes Foolscap, Folio, Statement, Letter A, C6, C5, Legal, B5, A4, A5, JIS B5, Letter Plus, and Executive, as well as custom sizes up to 8.5" by 14". It can also print to envelopes rated at Japanese Chou No 4, Monarch, International DL, Com-10, Japanese Postcard Double, Japanese Postcard, and Japanese Chou No 3. Automatic duplex printing is available as an add-on. However, other advanced paper handling features are not available with the 2430DL, as they often aren't on consumer grade, standalone printers. The 2430DL prints to a maximum resolution in both black and white and in color of 2400 by 600 dpi, beyond the average 1200 dpi often offered by either consumer or more industrial printers. The 2430DL includes 32 MB of RAM, upgradable to 544 MB. This is a considerable advantage over earlier MagiColor models, which included 32 MB but were not listed in their documentation as being upgradable and had conflicting user reports concerning their upgradability. The 2430DL includes support for Linux distributions, Mac OS, Mac OS X, and Windows NT 4.0, 98, 2000, and XP. It is not, however, currently certified as being Windows 7 compatible, though drivers for both the 64-bit and 32-bit versions of Windows Vista do exist and are, according to Konica Minolta, functional in Windows 7. The 2430DL includes a USB port and a 10/100Base-TX Ethernet port, allowing for networking without either compromising access to the printer's USB port or purchasing and installing a third-party external print server. The printer's slow output and small standard capacity essentially disqualifies it from even small office use, as many small offices go through at least half a ream of paper -- 250 pages -- daily. Installing an additional 500-sheet drawer costs over half of the printer's MSRP, bringing down its overall value, and adding a duplexer costs only $100 less than the printer itself, making an older printer with a faster output and those features already added more viable for environments in which either is needed. Review it: "Konica Minolta MagiColor 2430dl "
The printer includes four toner cartridges -- one black, one cyan, one magenta, one yellow -- rated at 1500 pages each at 5% coverage. 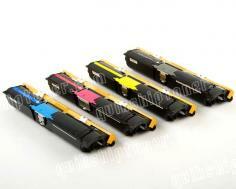 Replacement cartridges are rated at 4500 sheets each at 5% coverage. Furthermore, the drum unit and the toner cartridges are separate, meaning that the drum will also need to be replaced periodically. 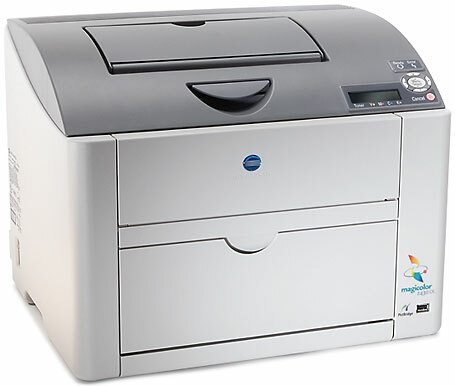 Drum units for the 2430DL are rated at 45000 sheets at 5% coverage, meaning that at approximately 10 black cartridges the drum unit will need replacing, though one's use of the printer will affect exactly when this point is. The separation of toner and drum brings down long-term maintenance costs, but does mean that more maintenance will need to be done in order to ensure printer function.